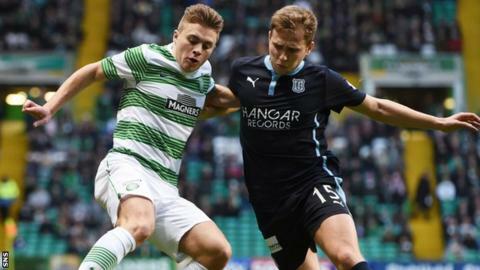 Celtic's James Forrest (left) retains possession from Dundee's Greg Stewart in the home side's 2-1 win. Celtic beat Dundee 2-1 to stay top of the Scottish Premiership. Here are the post-match thoughts of both managers. Celtic manager Ronny Deila: "I think it was a poor performance today. In the first half we didn't press together, Dundee had the ball too much and we didn't create so many chances. "When we have the ball we need to push forward more, there was too many sideways and backways, I hate passes like that. "But, we won the game and the second goal was fantastic. "We need to work on when we are up we continue to attack and we continue to press, then we will hopefully get three or four goals and not one against. "You can't always talk about Brooney [Scott Brown]. He was out today and we need to be a good team without him. "We win and that's the positive thing but the performance has to be much better on Thursday [in the Europa League]." Dundee manager Paul Hartley: "It was a hard one to take. I thought we were excellent. In the first half we played some good football, created good chances. "You know when you come to Celtic, a minute before half-time, you want to try go in at 0-0. We've worked on set pieces all week and good delivery. But, overall I thought we played some good football. "We came here with the intent to try and play, not many teams will come here and play, they'll come here and sit back and wait for things to happen. I thought we made things happen today. "We've been stressing all week you come here to Celtic you've got to be brave, you've got to take the game to them, keep passing the ball, and we did that. "I'm really pleased with the way they performed today. I'm really disappointed in the result and so are the players, but in terms of the performance I thought we were excellent. "We don't want any hard luck stories. Although we gave Celtic a game today we felt if we took some of our chances we could have won the game. "We've played Celtic twice this season and there's not been a lot in it."